If you're anything like me, every time you visit a mechanic you feel totally confused and taken advantage of. I spent time rehearsing the line "I'll have my dad take a look; I don't want anything extra right now." over and over as I would pull into the shop. And yet, I still walked away feeling pressured, uncomfortable, and clueless, especially as a woman. Now that I'm married to the best guy in the world, I don't have to worry about this. He not only takes care of the cars, he works on them on the side as a certified mechanic. 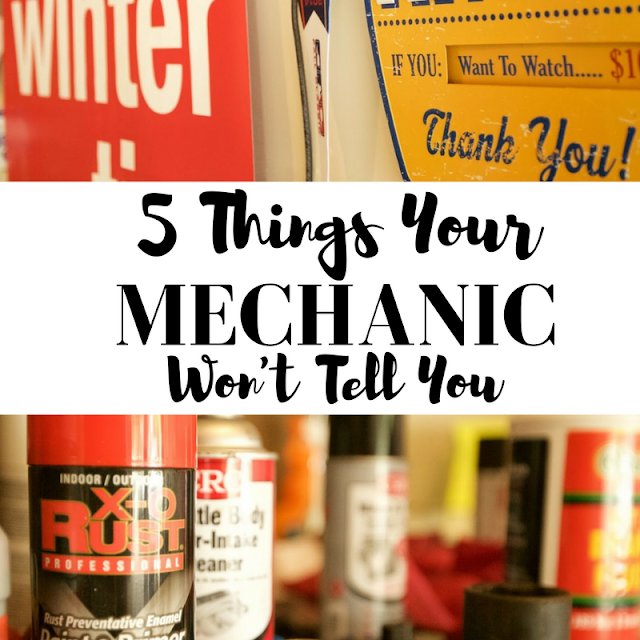 He's shared his insight with me for this post, and is helping me shed the light on five things your mechanic won't tell you. It's plain and simple: you will always pay more for the part than what the shop bought it for. The percentage can range anywhere from a 20% mark up to a 70% mark up. This is the main reason why most shops won’t let you bring your own parts. And if they do, they will often charge you a higher labor rate. It is roughly 35% of earnings for the shop as a whole. That’s a lot. When a job is quoted, the quote is for a fixed rate of time that has been predetermined by labor guides. If the labor guide says it should take two hours to change the alternator on your vehicle then you will be charged for two hours of labor, whether it took them one hour or three. Some mechanics work a forty hour work week but get paid for 100 hours of labor. Some mechanics work forty hours and only get paid for twenty hours of labor. The system is there to protect you from mechanics charging you whatever they want. It also rewards good mechanics who can work faster than the average mechanic. There are jobs mechanics don’t want you to know that you can do yourself. These kind of jobs might include changing out air filters, light bulbs, batteries, some belts, and brakes. While this isn’t true in all cases, you might be surprised what you can walk through on your own with a simple tool set and the internet. You might pay the shop $100 in labor for something that takes them 20 minutes to do, or it might take you an hour to do yourself if you just take the time to search and learn. Aaron will never understand paying $20 to install a lightbulb that takes less than three minutes to install. Do your research, people! When you drop off your car in most shops, they have you sign a document. Do you ever read what you are signing? You might not let your car stay if you actually read the fine print. Aaron has seen these documents cover wide ranges of things. A few years ago, he read the small print in a shop that isn’t in business anymore. He came across one line that read, “We are not responsible for any damages that occur to your vehicle while on our premises.” Yikes! Understand what you are signing, and ask if you have questions. Quite a few parts that are purchased include a lifetime warranty. However, the mechanic doesn’t want you to know this because they make money on parts. For instance, you can go buy the same exact alternator the mechanic will install in your car and it comes with a lifetime warranty. But the shop will give you a three month warranty in hopes that if it breaks in five years you will simply buy the part again. Aaron has changed the alternator on his father’s F150 about three times, after only paying for the alternator once. It also has about 400 thousand miles on it. You should know that most sets of brake pads have lifetime warranties as well. There you have it folks, five things your mechanic won’t tell you that you should probably know. You can really save yourself some money and some headaches if you're aware of these things. Have any more mechanic questions? Let me know and I'll pass them on to Aaron and get them answered! 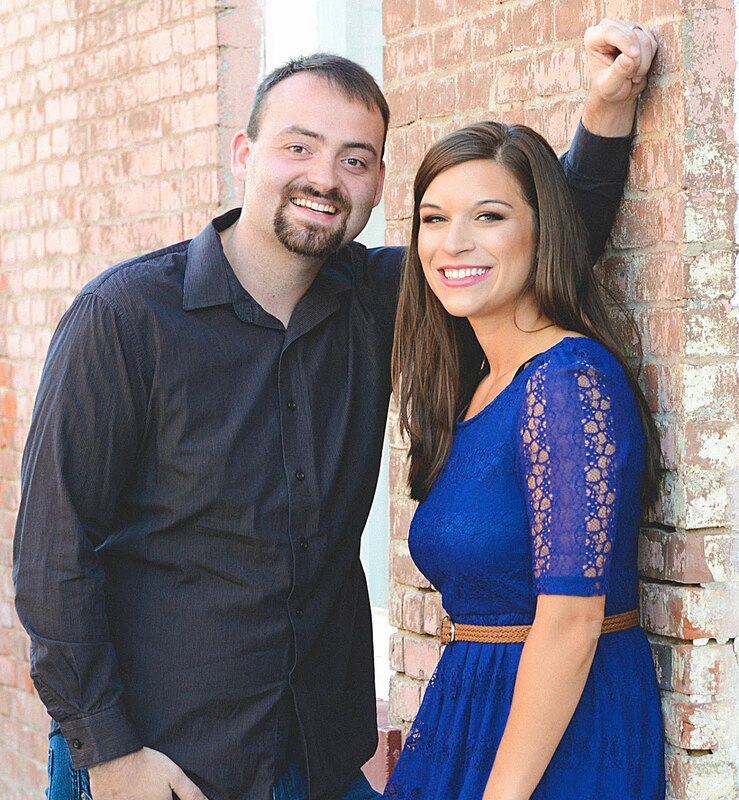 (And if you're in the KC area, he can even work on your car!) We don't have to be taken advantage of, y'all, so let's stop. So, I have a question! My husband got his break pads changed at Meineke. Does that mean he can go back if they go out again and say "I know these have a lifetime warranty", or would he have needed to buy the parts himself in order for that to apply? SO helpful Kelsie! I know this mechanic tried to rip my mom off once and she wasn't having it! After that I always looked into the warranty of a product or buying it myself and bringing it to the mechanic! My partner has learnt SO MUCH about cars just from YouTube! He doesn't trust mechanics anymore after one told him that he needed to replace all his eyes immediately because they were going to burst that day - that was over a year ago! His tires are fine, I don't know why they said that. It's unfortunate that so many are just looking to get as much money out of you as they can. Cars are such important parts of our lives and we just want them to run smoothly, I really wish people didn't take advantage of that! This was such a helpful post. 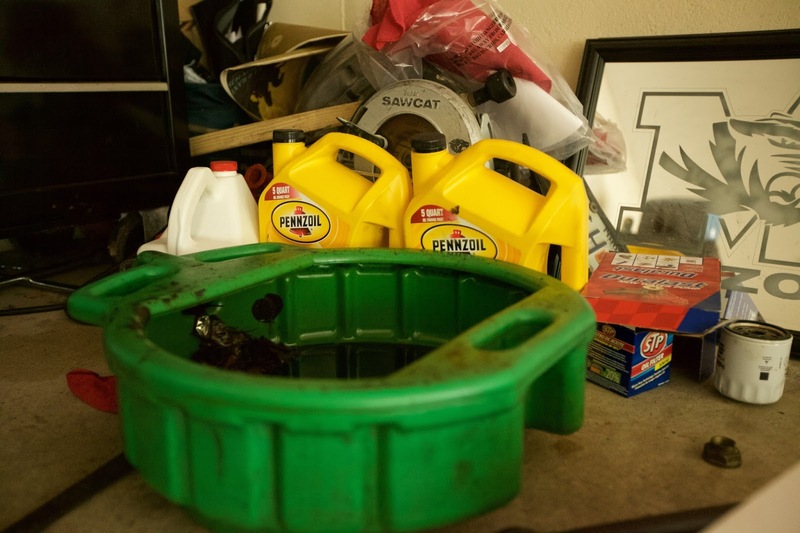 I've actually been struggling to fix my car, and this has cleared up many of my doubts. Thank you! Wow, I had no idea I might be signing paperwork that waives their liability for my car! Luckily I have a fairly handy husband who does most of the simple maintenance himself, but these are good to know!